I recently asked the Friends of my “Louise nhm Smith” profile on Facebook if anyone could recommend any good and warm swimming pools for a 3 month old and a 5 year old. Thank you very much to everyone who responded and thank you to Shona for putting this post together! These were the responses I received. They are in no particular order. Wendy said: Tadley is the warmest local pool but not sure they do a baby’s session on a Friday. The Sport Centre has a shallow pool which would make it easier. Heather said: I’d go to Tadley, it’s warm and there’s no chlorine. Caroline said: Tadley pool is nice and quiet. They have great sessions for very little ones where they raise the floor too. Karen said: You are better off in water that’d be chest height if you just going with baby as you can walk with them at a comfortable height without bending over. The raised floor is good for older children. I would recommend Tadley Pool for that reason. Kelly said: I have a 5 month old and a 5 year old. I found the Sport Centre in Town was great for my first attempt. Very warm, not too deep and small enough to focus on both kiddies. Left my pushchair in the changing rooms although they do have buggy lockers and took carseat onto poolside. Caroline said: Town is nice and warm. Ellie said: Good and small pool would be great with a 5 year old as well. 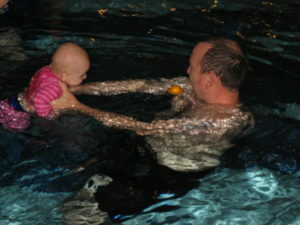 You can read my review on the Aquadrome on NorthHantsMum.